As a performing artist, you offer a unique blend of skills, talents, and experience paired with your own creative vision. With a continually competitive job market, you must effectively communicate your career strengths to get noticed by the right individuals. How do you do that? The first place to start is with a professionally crafted resume. Fortunately, our performing arts resume templates are here to provide pointers for structure, appearance, and content. Using our expertly-designed templates and helpful guidance, you can create a visually stunning document that also puts your work experience and talents front and center. Why Use Performing Arts Resume Templates? Job growth in performing arts fields can vary, but the Bureau of Labor Statistics projects new opportunities within the next decade. For example, actors may see employment prospects increase by 12% while musicians can expect a 7% growth by 2026. Tough competition is the norm in these and other performing arts professions, but a stellar resume is sure to give you a decided advantage. For professional performers still in school or who are just beginning their careers, an entry-level resume may offer some benefits. Our entry-level performing arts resume templates assist in maximizing one’s qualifications. These may be ideal choices for performing arts jobseekers who have internships, volunteer positions, or other types of unpaid career experience under their belts. Surprisingly, a chronological resume style may work well for some performing arts job candidates. This is especially true for those with no gaps in their work histories or who possess significant amounts of experience. Review our chronological performing arts resume templates to see many kinds of formatting possibilities for your own version. 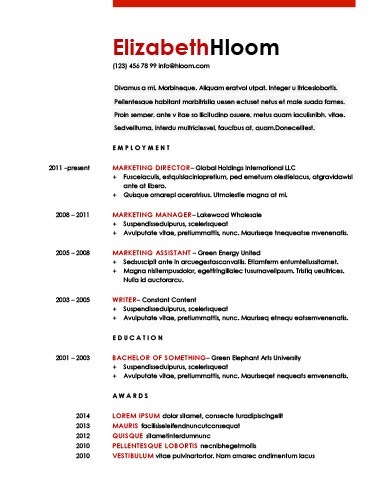 Using a creative resume template for your own version lets you target your document’s design to reflect the aesthetics and cultures of creative, innovative employers. Additionally, you visually differentiate yourself from other jobseekers when you use best practices for a distinctive layout and design. Review our creative performing arts resume templates for guidance on content organization, layout, and the inclusion of non-standard elements such as professional headshots. Recruiters for jobs in your field sometimes rely on Application Tracking Systems. According to the pros from The Muse, these software packages scan incoming resumes for pertinent keywords, scores and ranks them for relevance, and then forwards those matching the desired criteria to the recruiting manager. 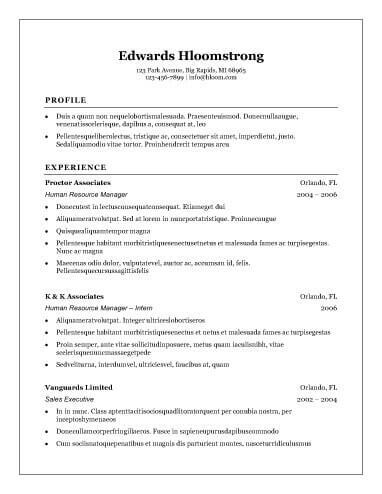 Our ATS performing arts resume templates show you how to employ keywords and a clean, uncluttered layout for your bot-friendly resume. Even in the performing arts fields, you may still encounter traditionally-minded organizations. Their hiring managers may find a basic, simple format easier to follow, so structuring your version in this manner boosts your chances of getting called for an interview. Thankfully, our basic and simple performing arts resume templates help you balance the goals of uncluttered design that calls attention to your content with a visually appealing look. Name: Your name is your brand. Include the version you use in your workplaces, and make sure it matches how you’re listed on your online professional profiles. Email address: Use a professional-sounding username, preferably some variant of your first and last name. Also, an Inc.com expert reveals that an AOL or Hotmail email address won’t do you any favors, so avoid using addresses with those kinds of domains. Phone number: Use a home or cell phone number in this section, and make sure your voicemail greeting sounds top-notch. Mailing address: You only need to list the city and state in which you live. Should you use the traditional objective statement or opt for the newer professional summary? That depends on your goals. Many jobseekers benefit from a well-written summary statement, but an objective statement may be more useful for job hunters in certain scenarios. Summary Statement: The Muse explains that a summary statement is a great tool for professionals who need to tie together lots of transferable skills, or a way to serve as a powerful brand statement for someone with a lengthy career. If you go this route, write yours as a "quick pitch" touching on your most relevant and compelling hard and soft skills. Objective Statement: Some entry-level applicants and career-changers can effectively leverage an objective statement. To achieve this goal, make sure you clearly demonstrate how you’d utilize your skills to bring value to an employer. Focus on Keywords: Review the job position and try to incorporate exact keyword phrases from it that accurately match your own skills. Format: Choose a bullet-point list with short phrases, and keep it between four and six items in length. Switch It Up: Revise and customize your skills section when you apply for each new position. Go Beyond Basics: Besides listing past responsibilities, include specific achievements that explicitly demonstrate how you benefited past employers. Use Lively Language: Using strong action verbs to describe what your professional achievements paints a detailed picture of your individual contributions to your organizations’ successes. Mind the Details: Include the name and location of each institution, your degrees and certifications, and the dates you attended. Go Backwards: List your previous schooling with the most recent experience first, then work in reverse chronological order. * Choose from a collection of professionally-crafted resume styles. * Tell us some basic information about yourself. * We suggest the best template for you, personalized with industry-relevant features. In addition, you get a wide range of bonus features, sound advice, tips, and tools to improve your chances of a successful job hunt. * Easily tailor your resume for each new job posting. * Resume templates with powerful customization capabilities. * Resume checker catches grammar, formatting, spelling, and typo errors before you send. * Expert advice and innovative tools to build your cover letters. * Access your files from anywhere at any time.